Increasing threats from terrorist activities and geopolitical disputes are expected to be the key driver for the global industry. The need to counter such activities will increase demand for arms and ammunition market share. Growing competition among countries for arms and related equipment to secure their national and international interests are likely to provide a stable growth platform for the industry growth over the coming years. In 2015, Stockholm International Peace Research Institute (SPIRI) reported the U.S., China, Russia and Saudi Arabia to be among the major investing countries in the weaponry industry. Moreover, technological enhancements for greater impact and longer range artillery will draw in huge investments. Decline in the defense budgets of several developed countries, especially in Europe, is expected to negatively impact the ammunition market sales statistics. Along with these factors, distinct economic, political, and legal standards in the different regions and their stringency would pose significant challenge over the forecast timeline. Regulatory norms for trade and export across international borders will also hinder the strategic expansion plans of the key players. Rising concern for the environmental impact of lead bullets for hunting and sport activities is likely to anticipate the overall civil ammunition market share. Increasing R&D expenditure and the rising demand for technologically advanced weaponry for defense force are set to provide potential growth landscape over the forecast timeline. Increased ballistic performance, smaller dimensions, firing rate, and lighter weights are expected to remain the key focus of these advancements. This market is broadly categorized into defense and civil application segments. Civil application includes self-defense, sports & hunting and law enforcement. Defense applications will continue to remain the dominant segment throughout the years. The segment is estimated to grow at over 2% CAGR and account for more than 50% of the ammunition market share by 2025. 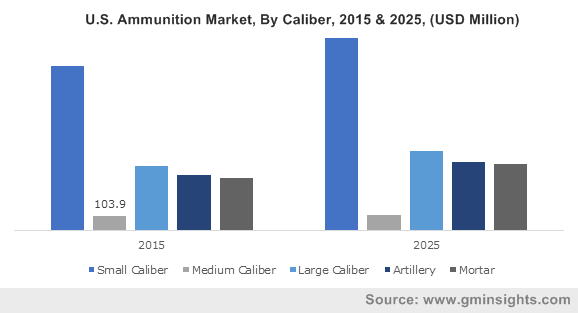 Civil ammunition application is expected to grow at comparatively higher growth rates owing to the rise in the population, disposable income and the increasing interest in recreational activities. Twice a year Russia hosts the UFI (Global Association of the Exhibition Industry) approved exhibition, ‘Fishing and Hunting’ in Moscow with an aim of demonstrating the latest foreign and Russian achievements in the hunting and fishing sector. This is anticipated to become a central annual event for fishing, hunting and tourism industry. Rising applications of small caliber ammo for civil and defense purposes will drive the industry growth over the forecast timeframe. This is due to easy availability, and ease of use for applications ranging from sports, hunting, regulating authorities as well as military purposes. Artillery and mortar find considerable applications in the defense segments, contributing to overall ammunition sector growth. Rising public attraction towards shooting sports and considerable advancements of non-lethal ammo such as rubber bullets, wax bullets, beanbag rounds, and plastic bullets for security workforce is expected to fuel the global ammunition market size from 2016 to 2025. Asia Pacific led by the India, Japan, and China ammunition market size, contributed 28% to the overall revenue in 2015. This can be attributed to the increasing defense budgets to counter the impact of the internal and external conflicts existing in the region. Growing participation in sports and other recreational activities will further fuel growth through the years. Consumer demand for ammunition has grown steadily through the years. Strong gun ownership indicators will drive the Russia ammunition market size. The rising participation of the foreign companies in Arms & Hunting exhibition each year held in Moscow was also reported to be a strong marker of the growing importance of the region for sporting arms, equipment, and accessories. The U.S. ammunition market share is estimated to experience fast growth owing to increasing firearms demand in shooting games and defense. The country is considered as a production hub and contributes a large domestic industry share for arms and ammunition sales; it is expected to witness consistent demand over the forecast period. Ammunition market share is fragmented, with the presence of several regional players. Participants include Olin Corporation, General Dynamics Corporation, Orbital ATK Inc., Nammo AS, BAE Systems, Remington Arms Company, Inc., CCI, Ruag Ammotech, Federal Premium Ammunition, Denel Pmp, Poongsan Corporation, Maxam, Global Ordnance, Nexter Munitions Magtech, and Hornady Manufacturing. Players are continuously striving for equipment upgrades to focus on providing high quality products at competitive prices. Formulation of stringent regulations may impact the overall industry growth. However, owing to the number of jobs, share of income tax and other such economic impacts that these industries contribute to a country, would also affect the formulation of these regulations. Industry participants adopt mergers and acquisitions among the key strategies to establish strong presence and gain profitability. Multi-lateral treaty to regulate the international trade of conventional ammunitions came into effect from December 2014, known as the Arms Trade Treaty (ATT). The purpose of the treaty was to regulate the international arms trade for international peace. Formulations of such treaty may provide industries with new opportunities for regional expansion. Ammunition manufacturing industry has witnessed increased volatility over the past years. U.S. industry experienced exponential revenue growth after the recession as uncertainties of more restrictive arms control regulations overrode consumers’ financial limitations. Additionally, Illegal sales for unprecedented activities constitute a huge share that is totally unaccounted. Lack of proper administrative and regulatory impositions in a few regional segments is the primary cause of these activities. Historical data coverage: 2012 to 2015; Growth Projections: 2016 to 2025.